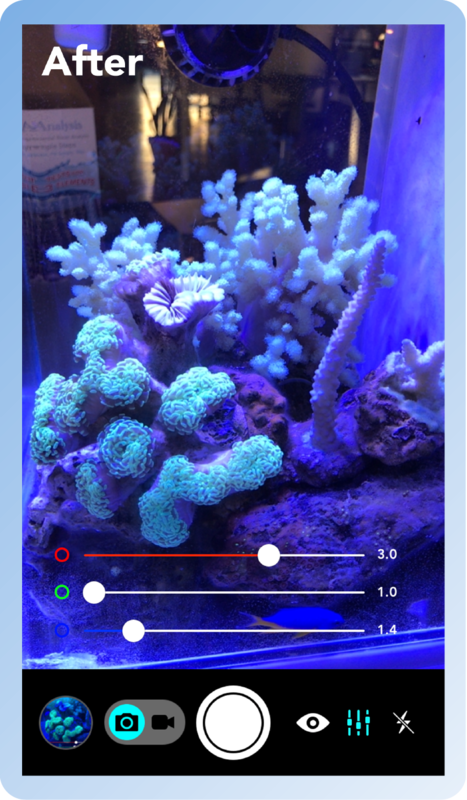 The best camera app for color correcting LED aquarium light in photos or video of your coral, plants and fish in real-time. Beta Test the next version! LED aquarium lights are brilliant, but all that blue (actinic) light can interfere with your camera sensor, changing the beautiful colors of your fish and corals into something out of a black light filled roller rink from the 1980's. Finally, you don't need a pro camera rig and special lighting to get great and accurate shots of your aquarium. You don't need to spend hours in post-production tweaking the hue and lighting of your photos. 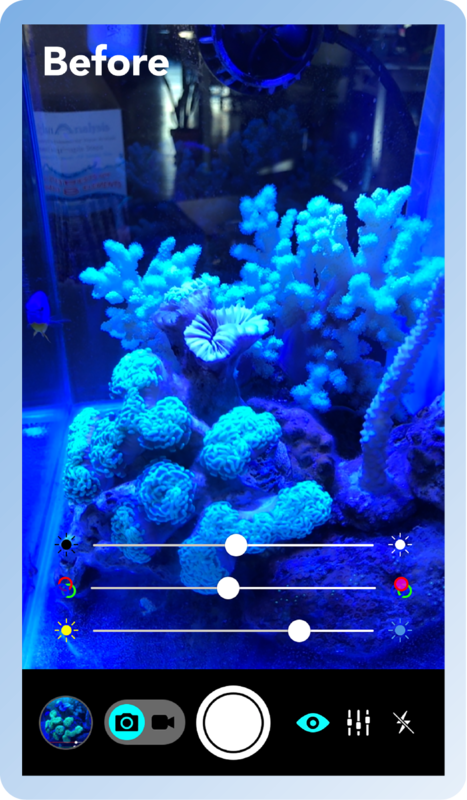 Simply put, you just need the Aquarium Camera and an iPad or iPhone to get GREAT photos and videos of your aquarium. 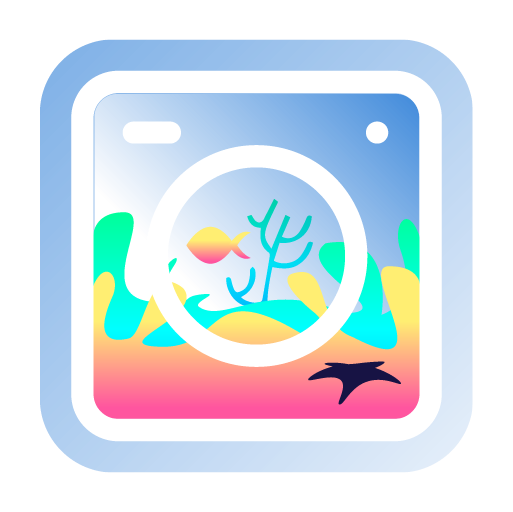 We created the Aquarium Camera app because we were tired of seeing posts of brilliant aquariums on forums like Reef2Reef, Nano-Reef, ReefCentral that don't truly represent the health and beauty of the fish, plants and corals inside. It was fine in the days of VHO, Power Compacts and Metal Halide lighting, but with LEDs now taking over the aquarium lighting space, we needed another solution. "So easy to use... Love it!!! And the color changing is realtime so you can see the screen and the real thing side by side to ensure you get the right balance." We spend so much time balancing our water chemistry and feeding our fish, plants, and corals to get the most out of their growth and color, yet in photos and video they take on a deep blue hue. It's frustrating. Posting to aquarium communities or aquarium log of photos and videos for how your aquarium has changed over time are ruined. We needed this app 3 years ago when we first started gluing our frags! Results will vary based on the shot because through software you can't completely remove the actinic light altogether #science. Depending on your LED light, the angle you shoot to the aquarium light and what's in frame, sometimes blue light hits the camera sensor and the photos still turn out blue-ish. Not as bad as using the normal camera app, but still annoying. SO, don't panic. You may have to play around with your focal point and angles. We've determined that this is pretty much unavoidable unless you get a polarizing or tinted lens for your device. The before and after shots in the preview were taken on an Innovative Marine 8 gallon nano tank under the original AquaIllumination Nano lights at 70% blue, 70% actinic blue, and 75% white.